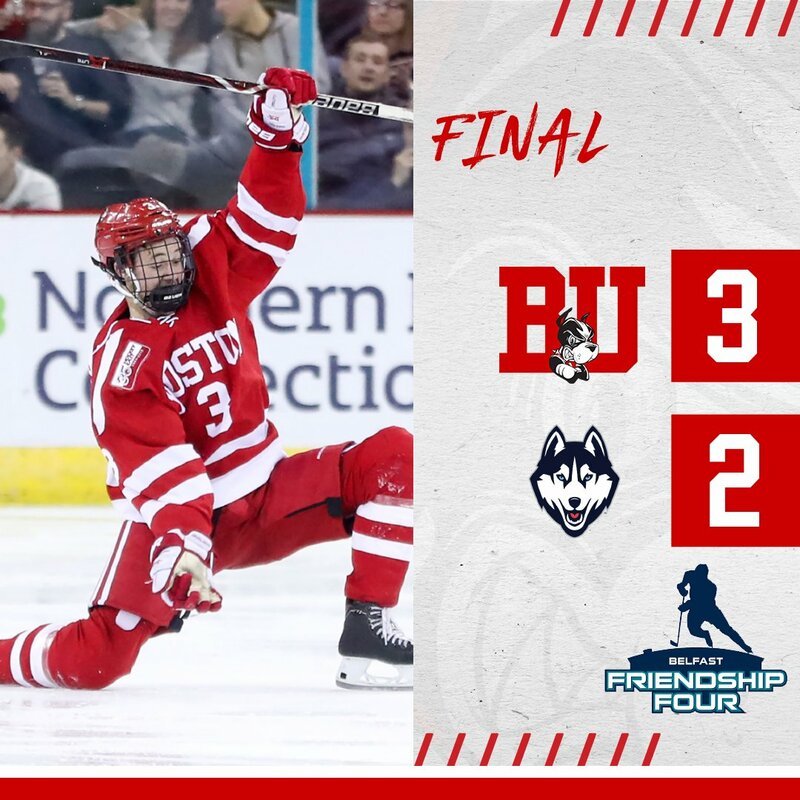 Ty Amonte’s first goal of the season broke a 2-2 tie with Connecticut and vaulted the Terriers into the Friendship Four Tournament championship game. BU, which also received goals from Patrick Curry and Logan Cockerill and a standout performance by goalie Jake Oettinger, will face #11/12 Union College, which edged Yale in a shootout. Game time today is 2 p.m. ET. The title game airs on NESN Plus and will be live streamed on ESPN+. BU rallied twice from one-goal deficits before taking its first lead early in the final period. UConn took an early lead when Karl El-Mir banged in a rebound from the crease. BU matched that score on its second man-advantage of the period. Max Willman dug the puck off the end boards and slid it to Mark Cheremeta driving from the bottom of the circle to the UConn net. Goalie Adam Huska poke-checked the puck away but Curry was right there to wrist it home for his fourth score of the season. For Cheremeta and Willman, the assists were their first points as Terriers. Late in the period, the Huskies regained the lead when Oettinger stopped a long slapshot, but an unmarked Jachym Kondelik converted the rebound from the right side of the crease. BU dominated the second period, despite a 13 to 13 shot count, and midway through the period knotted the score at two apiece. Patrick Harper sped into the offensive zone, went around the cage and attempted a wrap-around. Huska got a skate on the shot, but Cockerill, who had gained position on the defense, roofed the rebound for his second tally of the season. Early in the third period, Hugo Blixt sent the puck down the right boards and behind the UConn net to Amonte who skated out on the left side of the net, trying to jam the puck home. After the initial stop, Cheremeta got his stick on the puck and Amonte jabbed it past Huska for a 3-2 lead. Immediately following the go-ahead goal Oettinger made two big saves, sprawling toward the near post to stop a rebound after making the initial save. With just over seven minutes left in the period, a Matt Quercia penalty put UConn on the power play and halfway through it, Bobo Carpenter followed him to the penalty box. Cockerill, Dante Fabbro and Cam Crotty killed off the 5-on-3 and Oettinger kicked out six shots during the three minutes of power play to keep BU on top. The junior netminder stopped the final 29 shots that he faced and 37 of 39 overall. After yielding 16 goals in the first four games of the season, Oettinger has allowed 12 in the next six games. 1. The first period was reminiscent of last Saturday's game against Maine. BU was weak on the puck, lost the one on one battles for the puck, had scant presence in front of the UConn net. 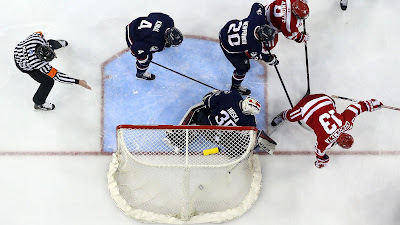 UConn scored its two goals after Jake Oettinger made the initial save and an unchecked player rapped in the rebound. 2. BU's play during the second and third period was much different, much better. BU adopted a different style of play, noticeably more physical than during the first period. BU consistently took the puck to the front of the UConn net, eventually reaping the rewards. 3. Oettinger had a strong game. He had very little chance to make the save on the UConn goals. By my observation, he made difficult saves look routine. 4. It seemed as if Dante Fabbro played about 30 minutes. He and Cam Crotty skated most of UConn's 5 on 3 during the third period, and, along with Ty Amonte and Logan Cockerill, kept most of the action on the periphery. 5. Jake Wise didn't skate during the second and third periods, although he was on the bench. His absence resulted in mix and match first, third and fourth lines, while the second line of Shane Bowers, Joel Farabee and Max Willman remained intact. 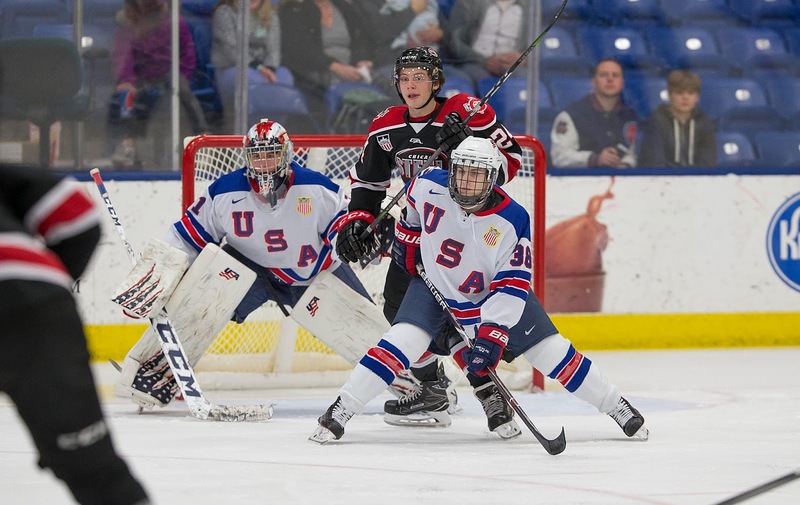 USA Hockey feature on 2019 recruit Domenick Fensore. 2019 recruit Vinnie Purpura stopped 19 of 21 shots in his first start for Youngstown in the Phantoms 4-2 win against Madison. Nick Bonino scored his third goal in Nashville’s 6-2 loss to St. Louis.